Yes, you read that correctly. 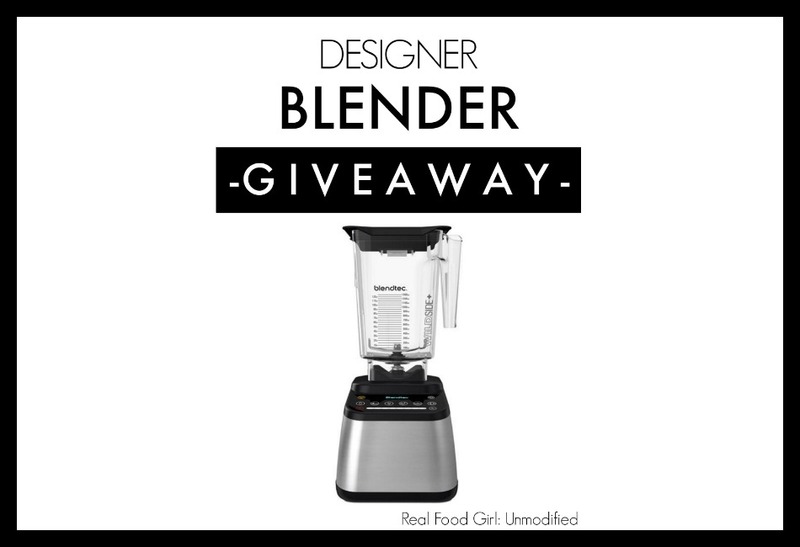 I’m giving away an amazing Blendtec Blender. Before I jump into the recipes, giveaway and my review of this phenomenal blender, I’d like to state that this is a sponsored post. Blendtec gave me a beautiful blender to use in my home and also offered to gift the same blender to one lucky Real Food Girl reader. I simply have to write a review. The opinions expressed in this review are mine. I wasn’t told what to say about the blender so that I could keep it real and keep it genuine. For this Giveaway, I decided to take it one step further and make a couple recipes, too! I’ll share a few recipes over the next week starting tomorrow. I wanted to make sure the first recipe didn’t get missed in the middle of a giveaway and review post, so look for the recipe Monday. So let’s talk about the blender, shall we? Blendtec sent me the Designer 725 with Wildside+ Jar This puppy is amazing! No seriously. It’s pretty darn fantastic. The Blendtec Designer 725 boasts the most advanced blending technology ever seen, providing the ultimate interactive experience. Features like SmartBlend technology, multi-speed pulse, and a 100-speed touch slider for precision control combine with a sleek, show-stopping design that will quickly make the Designer 725 the star of any kitchen. The capacitive touch slider provides seamless precision speed control for 100 speeds with the slide of a finger. It even goes a step further to help users achieve the perfect blend by illustrating which speed to use for stirring, chopping, mixing, blending, or pureeing. The Multi-Speed Pulse provides an added burst of power at any speed. The Blendtec Designer 725 features six preprogrammed custom cycles: Smoothie, Salsa, Ice Cream, Whole Juice, Hot Soup, and Clean. When using preprogrammed cycles, the machine will suggest additional uses for the cycle to give users a better idea of the cycle’s versatility. The “Add 10” feature allows users to touch their preprogrammed cycles and add 10-second intervals, providing completely customized blends. The Designer 725 rewards users for continued use through our exclusive Blend Rewards program. The 725 tracks each number of completed blends, then displays a code once certain blending milestones are reached. The code can be redeemed online for recipe books, gift cards, kitchen utensils, jar discounts, and more. I was pretty pumped when I took this blender out of the box, plugged it in and it said “Hello”. It actually doesn’t speak out loud, it just displays text, but still, how nifty is that? I’m probably too easily impressed by some things, but I thought that was a fun feature that made using the blender even more enjoyable than it already is. As long as this little computerized genius doesn’t become self aware, or turn into a Autobot killing Decepticon death machine, I’ll be happy with this blender for years to come. When you open your box, you’ll see, aside from the blender, obviously, a small Blending 101 booklet. In this booklet you’ll get some recipes and blender basics. 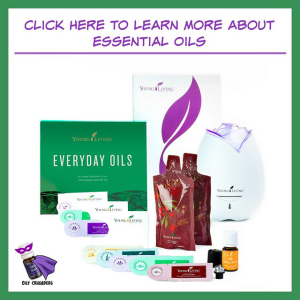 You’ll also have access to their website where you can get updates on recipes from their blog, redeem rewards points for reaching blending milestones, register your product and contact customer service, among other things. Oh, and if quality packaging impresses you like it does The Stud Muffin, you’ll be impressed with that, too! Another feature that I love is that the base is super easy to keep clean and wipe down. There are no knobs, or buttons (grooves and crevices) where food can get lost or dried. So a couple months later, my blender still looks shiny and new. I despise having to detail my blender just to get it clean. If I’m going to spend that amount of time detailing something, it’s going to be my car, NOT my blender. Before you get ready to use your blender, just give that little wheel at the base of your carafe a twist. Sometimes it likes to stay put, and it won’t line up on the base. After you twirl it before several uses, it’ll be old hat and you’ll never forget. In my opinion, the large wideside+ jar is something that should have been invented AGES ago. What an immense improvement over my old blender. I love the room this wideside jar affords me! I feel spoiled! In the past, when making my One Pot Jalapeno Chicken Corn Chowder, I would have to add 2 cups at a time of the soup to my old blender and make sure I had enough liquid in there to get it to blend and not create that air pocket right above the blade. (That’s called cavitation in case you’re a trivia buff) With my Blendtec, I don’t have to worry about that. I can scoop in a good 4 cups of soup and just hit pulse at a med-low speed and it gets the job done. It’s so easy. I also love that the cover on the blender is vented. This means I no longer have to take that center piece out of the cover and hold a folded towel over it while blending hot mixtures while praying I don’t burn my hand. Having a vented cover allows for you to blend warm/hot mixtures without worrying about steam building up and turning your blender into a small rocket launcher. This blender is easy to use, easy to clean, easy to maintain and easy to store. It’s not a pain in the neck to use like other small-appliances I own (cough, cough, food processor, cough, sneeze, cough). I believe that you will enjoy this blender for years and you’ll enjoy all the amazing recipes that you can create using this blender. You can make your own gluten or grain free flours, you can go on a smoothie making binge, you can make breads, soups, dressings, dog treats. Your options are endless. Do you want quick meals on the table without having to slave in the kitchen for hours. Then try some of the recipes that Blendtec has on their blog. Lastly, I enjoy the rewards that I earn when I reach blending milestones. When I hit 50 blends I got a snazzy cook book with over 200 recipes for the Blendtec for FREE! That’s right. I didn’t even pay shipping! It’s a clever little tool designed to motivate you to use your blendtec daily and incorporate some healthy juices, smoothies and more into your meal planning options. I will say the one thing I don’t like about this blender is that some of the ingredients in the recipes they provide are not ingredients that I would use. I don’t use Agave nectar. I don’t use Canola Oil, I don’t ever let Soy Milk touch my lips. 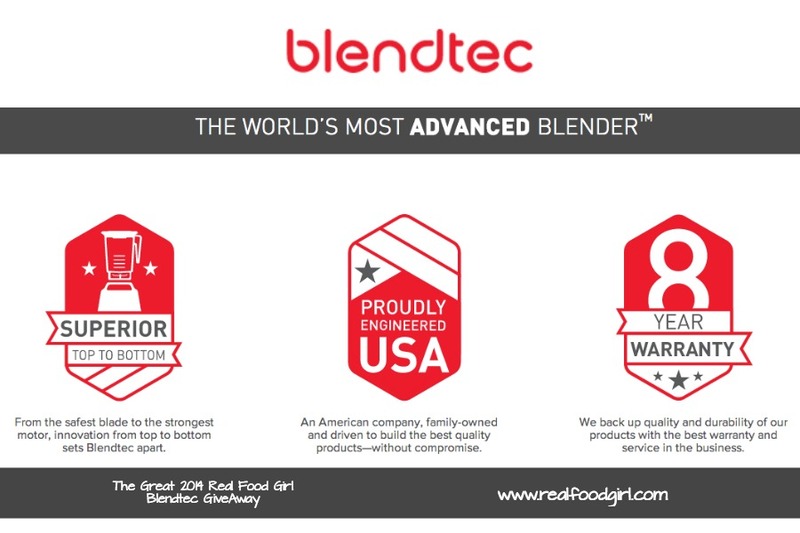 I do wish that Blendtec would be willing to take a que from some of the Real Food and Whole Food bloggers that endorse them and start revamping their recipes or including more that don’t use well-known GMO ingredients. 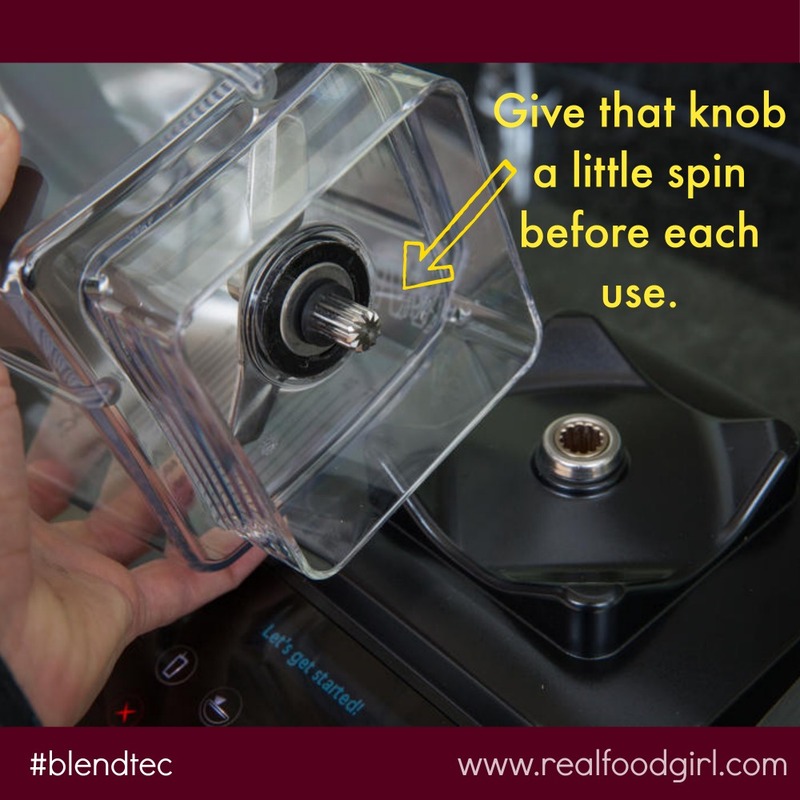 Yes, it’s totally easy enough to make a substitution and Blendtec is kind enough to answer any questions you have on their recipes in a timely fashion, so there is that. They do have fantastic customer service. Speaking of customer service, I was able to experience just how great their skills are. I’m being 100% truthful when I say they are top-notch and care about their customers. I had an issue with my serial number on the base of my blender not matching the serial number that came up on my LCD display panel. I had already registered my blender with the incorrect number, so when I went to redeem my blend awards code, it wouldn’t accept my code. Long story short, my contact person, Kelly and her boss Rick ended up doing a conference call with me and walked me through the fix, got their IT department involved and within 20 minutes everything was fixed and A-OK. They were patient, kind, and Rick is a huge fan of Ghost Busters. Just in case that kind of thing is important to you. Because it totally should be. I think if the worst thing I can find about this blender is a few unpopular ingredients from their website, which has nothing to do with the actual blender, so all things considered, this is a fantastic blender that is up to any task I can throw at it, and I’ll be sharing some of those tasks with you in the coming days and weeks. Are you ready for your jaw to drop people? The blender they gave to me and are also giving to ONE LUCKY winner is a $649.95 value!! Yeah, you read that right. Almost $650!! WOWZERS!! Oh, and to sweeten the pot even more (like that’s even possible) they’re throwing in the Twister Jar set, too. That retails at $119.95! We’re talking an over $760 prize package guys. That’s SUPER generous!! 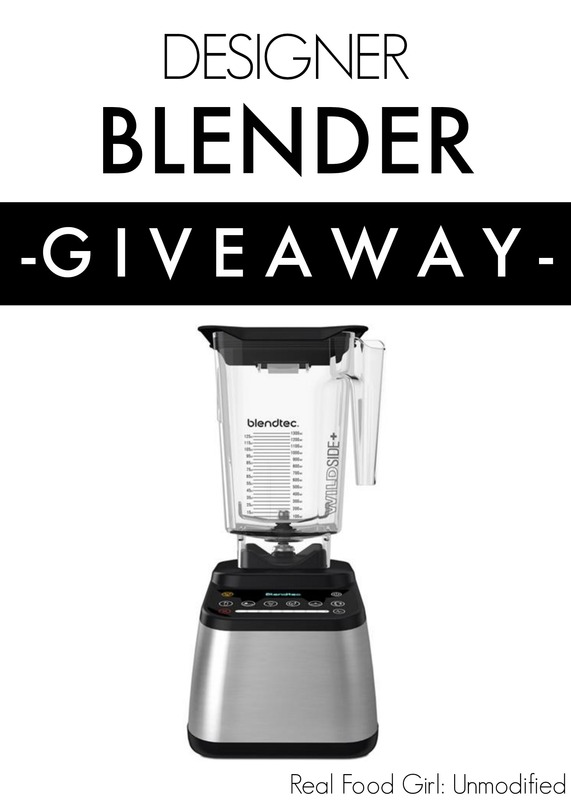 You totally want to enter to win this blender. I could be your Christmas present, or you could bless someone else with this!! Either way, share this post with everyone you know and enter to win. I should warn you that this blender is a little cheeky and a wee bit sarcastic. One day, I forgot that I had the smaller blending jar on the base, not the large one. I added too much water for the self cleaning cycle. I didn’t put the cover on tight enough and warm, soapy, foamy water exploded all over me, the kitchen, floor, ceiling… it was hilarious and a mess. What did my blender say after it finished that cycle? It said “You should be a Chef!” Um, ya think? Crimany, if I had a Chef Card, it would have been taken from me pronto had they seen that rookie error I made by putting too much liquid in the blender jar. Each time you blend something, the blender comments. “That looks yummy!”, “You should tweet this!”, “Enjoy”, “That was fun”. “Let food be thy medicine”,”You’re amazing”, “Your friends are jealous”, “A smoothie a day keeps the doctor away”, “Let’s make some YUM”, “You should be a chef”, and many other fun comments. It will also give you ideas of recipes to try and display the link where you can find them online. I swear that blender knows what I’m doing and it makes the funniest comments on cue. It’s got comedic timing! My old blender didn’t have comedic timing. This contest is open to residents of the US and Canada. This contest begins on Sunday, November 30th at 12:00 am and ends on Sunday, December 7th at 11:59 pm. ONE winner will be chosen at random using the Rafflecopter Widget. 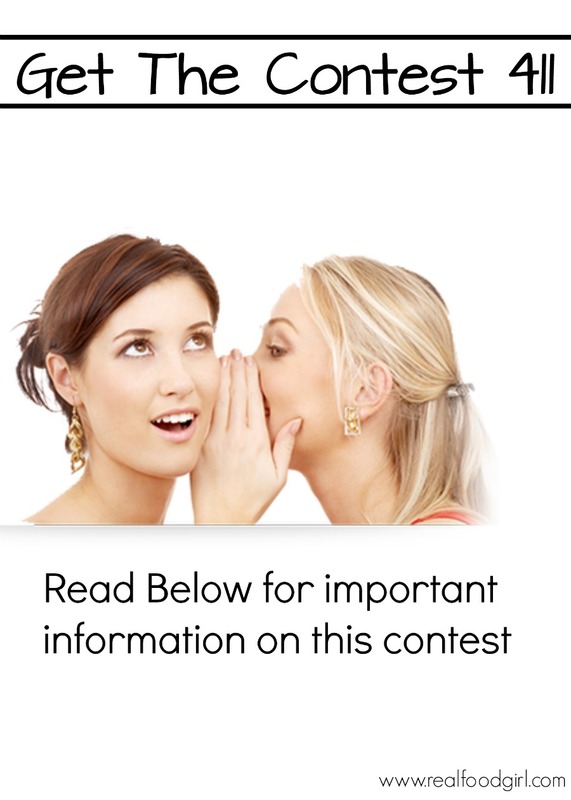 The winner must provide a working email address in order to be contacted for their mailing address, so the prize can be sent out from Blendtec. 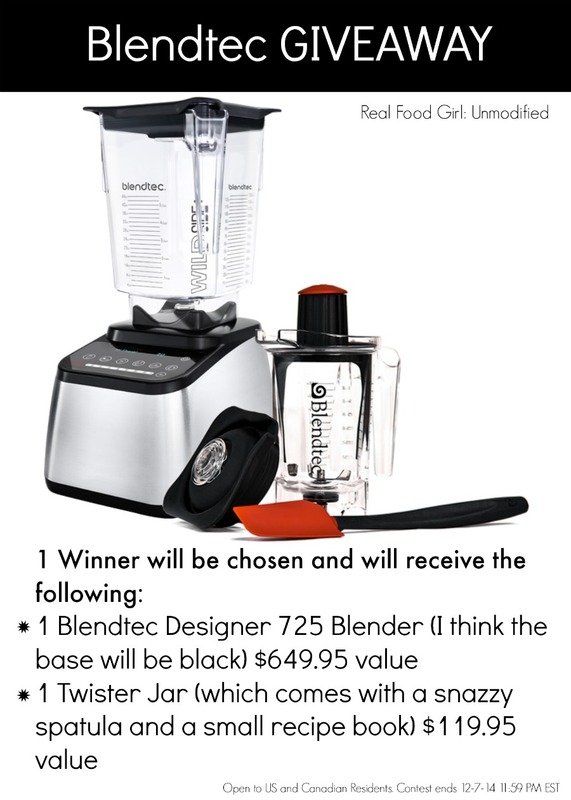 Blendtec is providing ONE Blendtec Designer 725 blender and ONE Twister Jar set (pictured above) to one winner. Blendtec will also be responsible for shipping prize to randomly chosen winner. If the winner chosen, doesn’t respond within 24 hours, a new winner will be chosen and contacted by me, via email. I will email and announce the winner on the blog and on my FB page at 12:15 am on December 8, 2014. Using the RAFFLECOPTER widget in the middle of this post, simply respond in a comment below, telling me what the first recipe you’d try in your new Blendtec 725 would be and LIKE the Real Food Girl: Unmodified FB page. That’s it! Nothing else! Nada! Share this with your friends, feel free to pin it, tweet it, post it on FB, instagram, whatever you want. The only thing that is mandatory is a blog comment and liking my FB page. YOUR COMMENT MUST BE ABOUT ‘WHAT THE FIRST THING/RECIPE YOU WOULD TRY IN YOUR NEW BLENDTEC BLENDER’. NO EXCEPTIONS. COMMENTS NOT FOLLOWING THIS SIMPLE REQUEST WILL NOT BE COUNTED. I would make a milkshake. That thing is almost intimidating it’s got so many bells and whistles! What a cool and useful thing to raffle off! Thanks for being you and doing the giveaway! My first recipe to try would be ice cream for my hubby! I’d blend some CDs like I saw on will it blend. The first thing I would make would be a fruit smoothie with greek yogurt.. This first thing I would make is almond butter. We would make our kale smoothies!! I will make smoothies for my children and myself. That thing looks awesome! Thx for the giveaway! I’d make smoothies. I would lile to make a mango and peach smoothie as a start. Then ill added pomegranate and other various fruits for a healthy drink. The first thing I would make is a cream of broccoli soup. Thanks! The first thing I’d make is some fresh pesto! Our current blender isn’t very strong & can’t a smooth consistency! I’d make a green smoothie! Then a nut butter!! Yum!! I would try my fermented hot pepper sauce recipe with this! I have get to get it super smooth! I would like to make a healthy green smoothie for my mom and brothers !